The second crop of rabbiteyes starts in July (around the 7th) looks very good. The only way to really know is to call ahead: 828-628-1758 with any questions. 2018 Recap: We had a fair crop of early Northern Highbush in June. 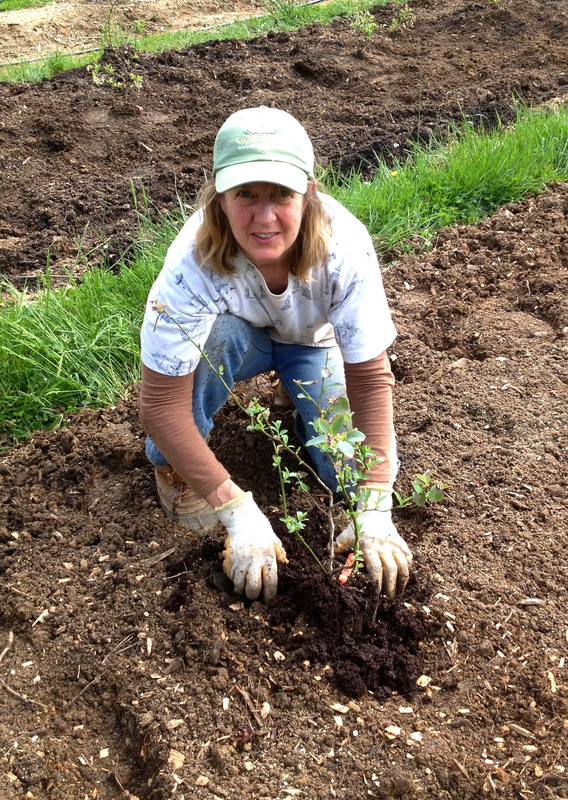 We opened the week of June 18 with our first crop of Northern Highbush, a little later than usual. The first picking was for invited guests only (those that have picked for several years in a row). They were gone in a week! They came and were picked out in 5 days by June 23! Then we had a 2 week break and opened to the public on the later producing rabbiteye variety. That was July 7 on a Saturday and every Tuesday and Saturday in the month of July. $16/gallon (which weighs 5 lbs) or $3.50/lb. We continued to pick until the third week of August! 2017 Recap: We had two distinct crops. a flush of Northern Highbush that came really early, June 11 instead of at the end of June. Then there was a break and the Rabbit Eye came in at the end of June and were finished by the end 29th of July. Sometimes that goes into August but not in 2017. WE WERE OPEN TUESDAYS AND SATURDAYS AND POSTED exact dates and times on this website. 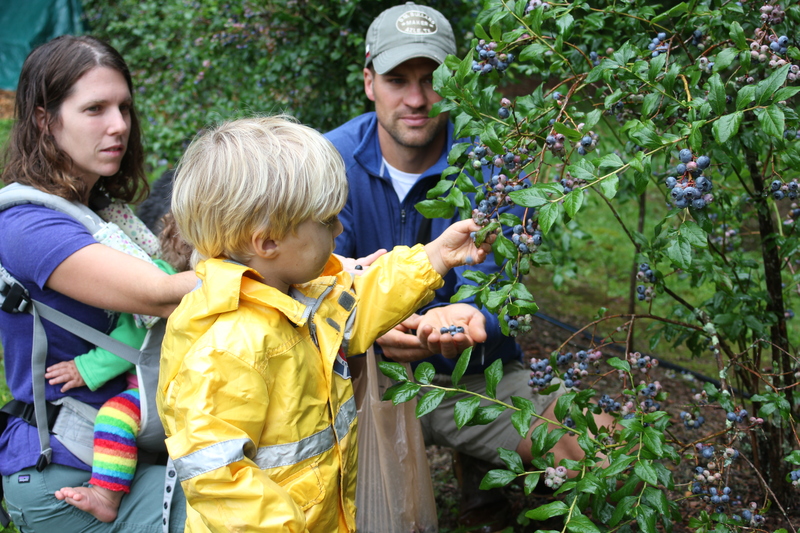 Kids love picking (and eating) the berries fresh from the plant as we use no sprays. They delight in the discovery of the biggest blueberry and in the freedom to walk the rows of neatly mowed grass in between the rows. You might have to be honest and pay for what you’ve eaten, though! Of course, the birds get their share, too. 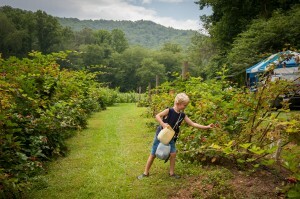 Blackberry row is fun to pick, too! Bring the babe with you to pick! 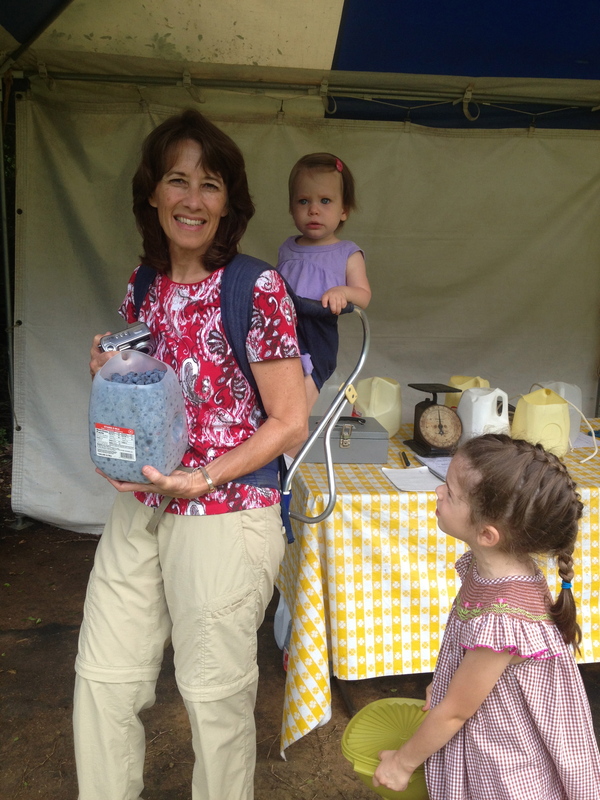 Picked a gallon with two helpers! A baby bird found in the blueberry bush! 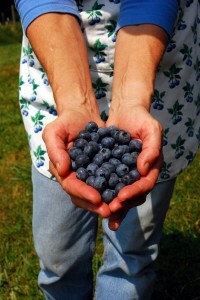 There’s nothing like the fresh antioxidants from the blueberry to maintain your health! Bring a container to put your berries in to take home. We pick in cut-out gallon milk jugs tied around the waist. Then the gallons are weighed and poured into customers’ take-home containers. In fact, if you have any rinsed out milk/water/tea jugs, we can always use more to freshen up our stock. The season begins the last week of June and goes through the third week of July. It is always best to call ahead or email for an update: 828-628-1758. Prices are $3.50/pound or $16/gallon (which is a little over 5 pounds). Cash or check only. We have rolling to level terrain that is kept mowed. The grass is dewey in the morning so wear waterproof shoes. Bring your own water as we do not have any source for drinking water here. We do have a green, out-house at the bottom of the patch. We do not spray any pesticides on our plants or berries because we value the native pollinator population and our own honey bees that help make our crop. Besides, we believe you should be able to trust fruit right off the bush as you do the taste test to determine which ones to pick! Well-behaved children only. You must keep your children with you as there are ponds and creeks and poison ivy they could wander into. Our liability insurance is for the patch area only. NO DOGS in the patch. We keep your safety in mind but, as always, be aware of your surroundings. 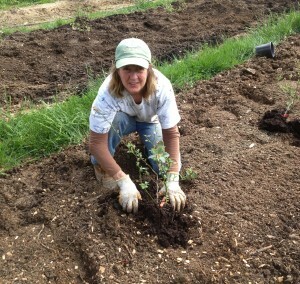 More blueberry bushes get planted each year. This patch was created out of an old corn field in 1967 as a hobby farm for the newly-retired father and mother Peterson to have something to do! After all, the Peterson grandfather raised strawberries and trees in the early 1900s in Minnesota, thus instilling the love of the land. 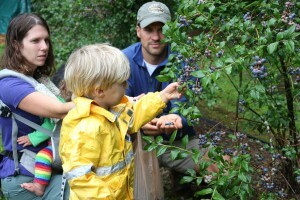 By 1974, every row in the 4 acre patch was planted and thriving as a U-pick Blueberry patch open to the public by appointment. This patch provided and provides today, the good feeling of purposeful living. 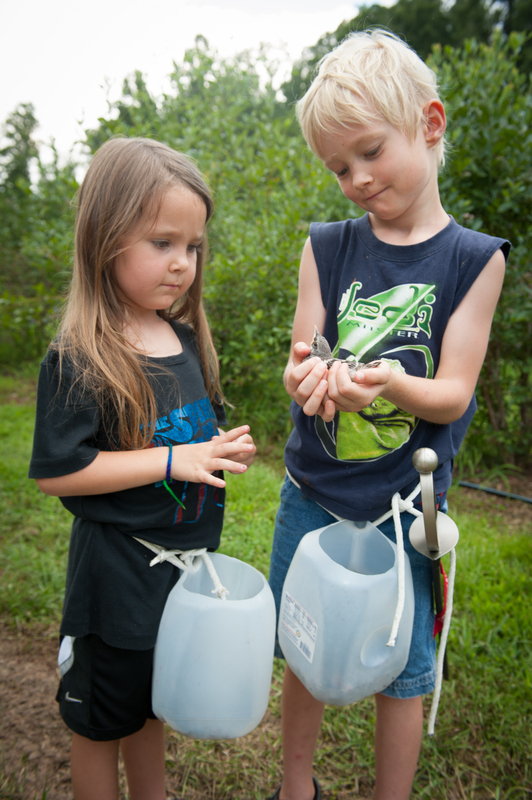 The patch continues to serve over 70 families for their U-Pick needs and has seen 3 generations of pickers experience where food comes from. There is nothing like the sweet smell of blueberry blossoms in the spring enlivening the bare shrubs drawing the honey bees and native pollinators to the flowers for a bountiful blue crop in late June. Follow your directions of choice below. When you arrive, park right inside the gate or along side the road out of the way of traffic – near wood chip pile/blue and white tent – unless it is raining and too slippery for cars, then park on the road. Instructions will be on the table or in the tent. NOTE: Do not go to a house or up a mountain. The patch is in the valley along the road. Go on highway 74 A East for 5.2 miles towards Fairview. Go 1 mi to patch on left/blue gate, tent and hut behind the big pile of mulch. Find the Ingles/EarthFare intersection; Turn onto Mills Gap Rd. (You will go past the Cloud 9 mailbox #137) to blue gate on left. Park in field unless it is raining and to slippery for cars, then park on road. Instructions will be on the table or in the tent. I will be somewhere nearby if you call me at 628-1758. Turn onto Cane Creek Rd with a CVS pharmacy on the corner. Go 2.3 mi. to the 2nd light. Go diagonally across Mills Gap Rd. to a continuance of Cane Creek Rd. (sign will point to Cane Creek Middle School). Go another 2.7 mi. Turn L on Concord Road (it comes up fast). Go 2/10 mi. Turn R on Gravely Branch Rd. Go to end. Turn R on Emmas Grove Rd. (no sign) Go 1 mile and turn a sharp L on Bob Barnwell Rd (after the church). You will go past the Cloud 9 mailbox #137 to blue gate on left.